Picture perfect Friday in the city of Hermosa Beach, the city of beach side bliss. With sunny skies, fresh air, the cool ocean breeze coming towards me, today I was at the heart of Hermosa Beach at Pier Avenue. Pier Avenue for me is where beach side happiness starts because it’s down this street that you find the cute boutiques, fun beach shops and delicious eateries. It’s the street of beach smiles. Now right at the start of Pier Avenue, there’s another reason to smile because of newly opened Hermosa Beach Fish Shop! The original fish shop restaurant is from my other favorite beach side bliss city, San Diego, via Pacific Beach Fish Shop. 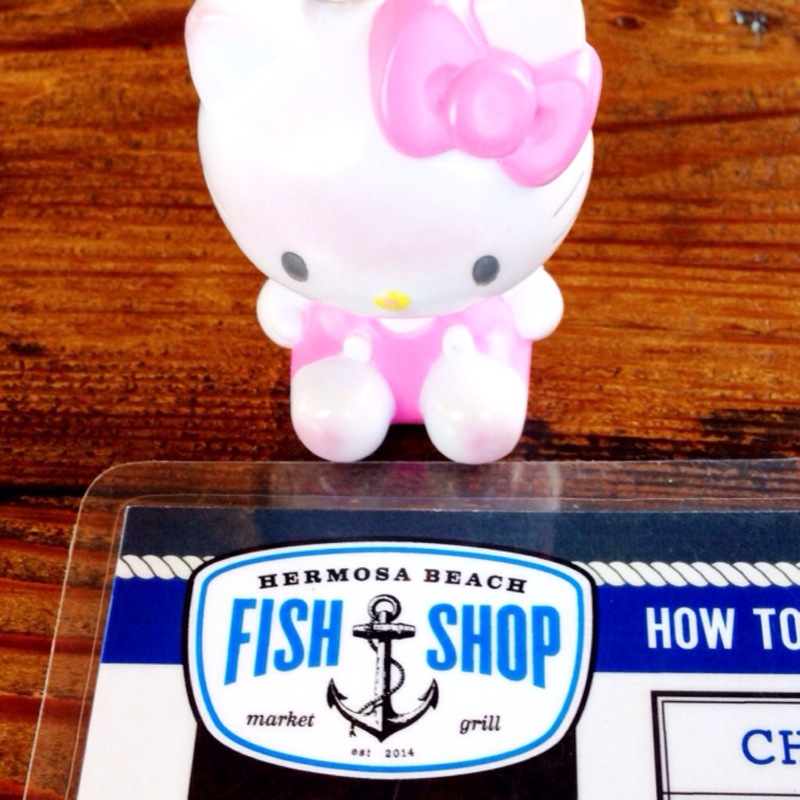 It’s sister restaurant is now in Hermosa Beach as the Hermosa Beach Fish Shop! The Hermosa restaurant has only been open for a couple months and plenty of people on their way to the pier are already flocking to this new beach eatery. I was super flattered and honored when I recently received an invite to dine at Hermosa Beach Fish Shop as a media guest. 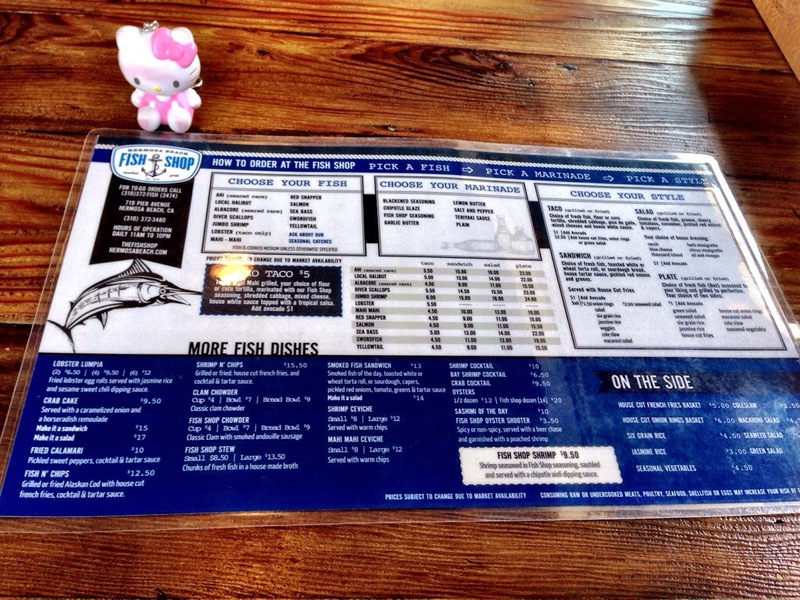 I dined at Hermosa Beach Fish Shop today and the very first thing I noticed was their menu. The menu is perfect for any Seafood fan! Folks dining here have the choice of selecting which seafood and marinade they want and whether to have it as a taco, salad, sandwich or plate! The menu also has plenty of sea options such as chowder, ceviche, oyster shooters. I came here with my mom because she is a big seafood fan. We started off our meal here with a cup of Fish Shop Chowder. 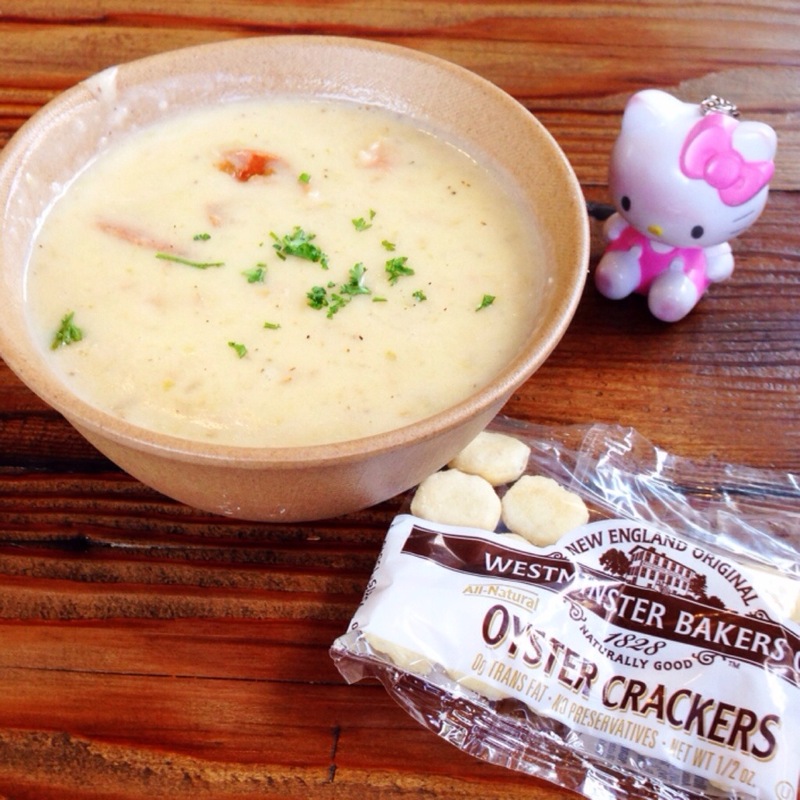 It’s clam chowder with a twist because it’s clam chowder with smoked andouille sausage. I really enjoyed this soup! I liked the thick, creamy broth and I was such a fan of the smoked andouille sausage. I thought this touch was great. The chunks of sausage brought extra depth and flavor to the soup! Our other starter for this meal was the lobster lumpia. This was also a nice little appetizer! 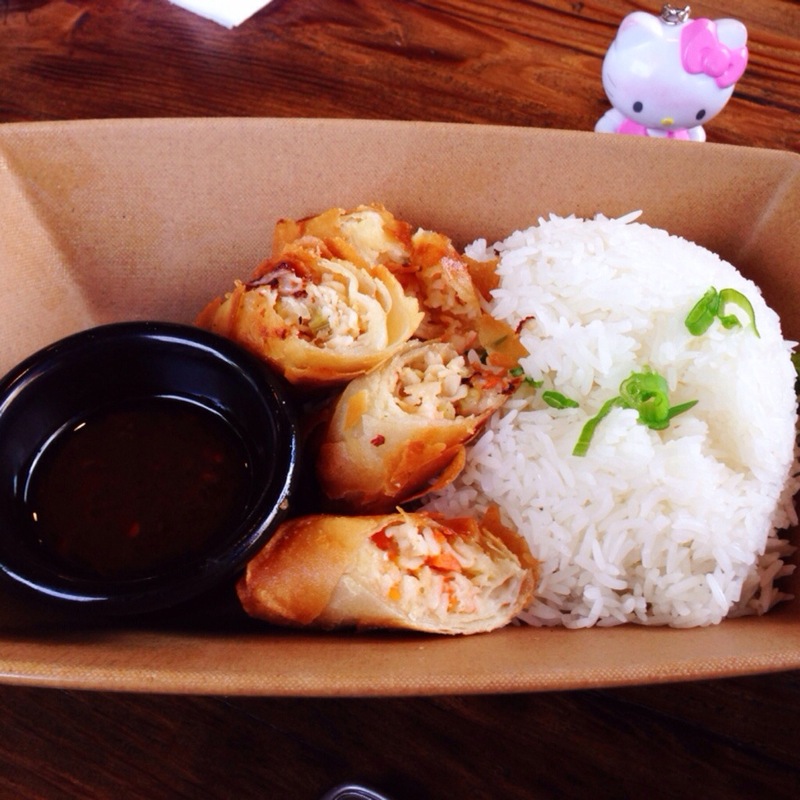 Little crispy fried egg rolls are filled with shredded lobster! It was served with jasmine rice and sesame sweet chili dipping sauce. My mom chose to make her own fish entree. Her customized dish consisted of sea bass with garlic butter marinade and sides of six grain rice and seasonal vegetables. 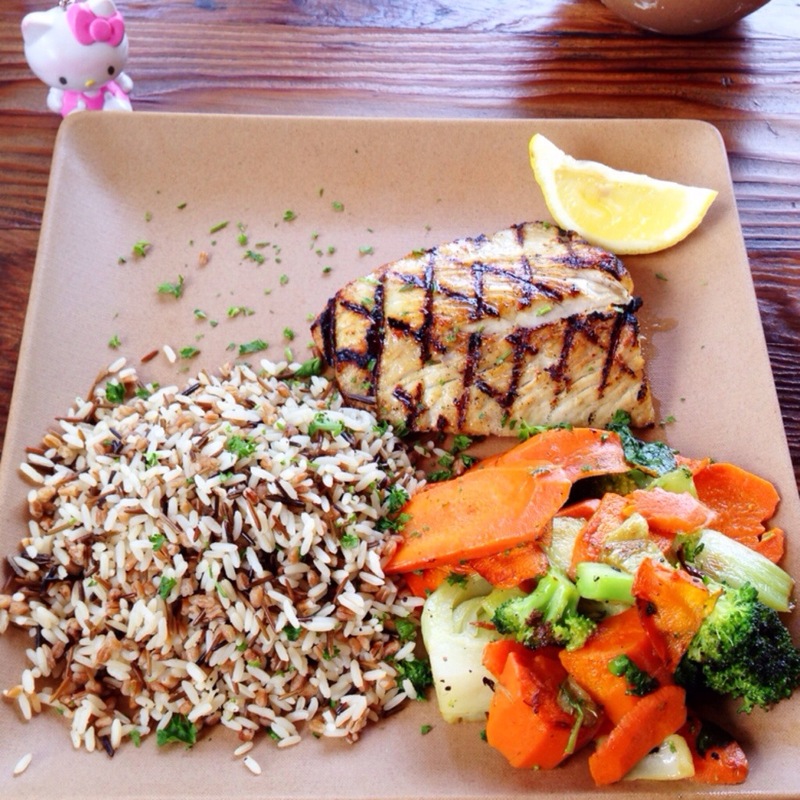 It was a very healthy dish with the grilled sea bass. I got to try the six grain rice and found it be well seasoned and flavorful. 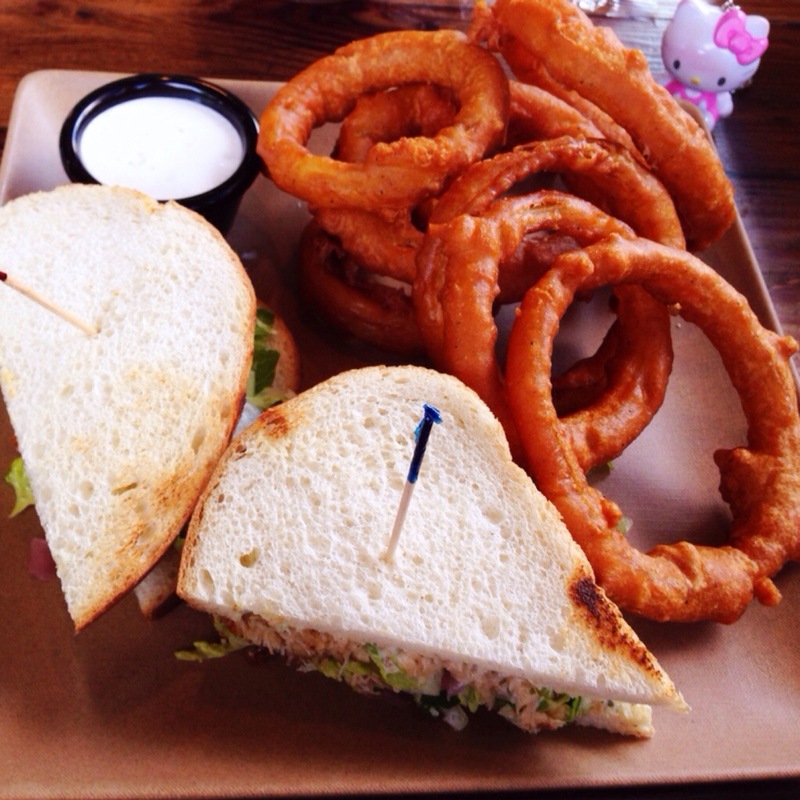 I got the crab cake sandwich with a side of house cut onion rings. The crab cake sandwich was filled with a big crab cake, caramelized onion and a horseradish remoulade. I was impressed with this crab cake sandwich. The crab cake itself had a crisp crust on the outside and a creamy filling on the inside. The caramelized onion and horseradish remoulade made for a nice relish. The onion rings were a great side! The onion rings here are made fresh to order and so they come out nice and crispy. They hand batter each. The batter has a nice, buttery like flavor to it. I am a fan of these onion rings! 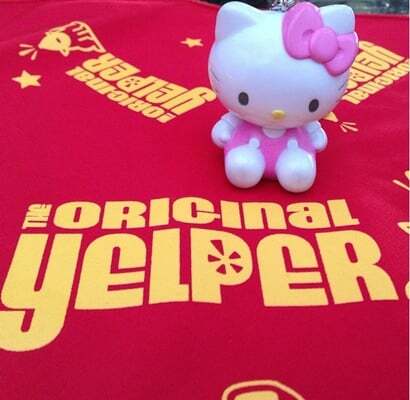 For more smiles, please see my recent Yelp review on Hermosa Beach Fish Shop.